Chipboard : Standard, Flooring, Melamine Faced. 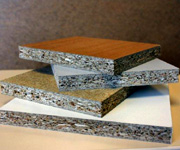 Chipboard - Standard Chipboard, Chipboard Flooring, Melamine Faced Chipboard. We offer a large selection of Chipboard types and finishes available from stock held at our warehouse in Keynsham near Bristol. Chipboard - most of the boards can be supplied cut to size & finished to order with matching or contrasting edging in Wood Veneer, Melamine or PVC material. The Chipboard items listed are all regular stock items and there are many more finishes available from manufacturers and distributors. Avon Plywood Ltd can and does source alternative boards to order on a regular basis. Please ask for details or bring in a sample to try and match your particular requirements. Most of the range is sourced from FSC ® (Forestry Stewardship Council) accredited sources. Chipboard : Standard, Flooring Grade & Melamine Faced.